The Conscious Shopper asks, "What does community have to do with the environment?" On Saturday, we headed downtown for our favorite local festival: Bugfest, a celebration of all things buggy - even down to the food (chocolate chip cricket cookies and mealworm hush puppies....Mmmm!) This weekend, we'll probably head back downtown for SparkCon to celebrate our city's creative side, and later this month, we'll be helping KaBOOM build a playground around the corner from our neighborhood. We also have plans to host a block party for KaBOOM's Play Day 2009, and we're still debating whether or not we'll be able to participate in the Raleigh Typhoon, a scavenger hunt to see how well locals know their downtown. 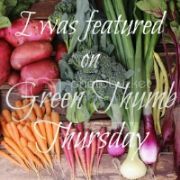 But truthfully, I think all of these events are related to going green because they are all about getting to know our neighbors and being involved in our community. And rebuilding strong communities is essential to saving the planet. 1. A strong community shares resources. A couple weeks ago, I was wrestling with a shovel in my front yard. The ground here is like a sheet of solid red rock, and my shovel and I were losing the fight against it. A neighbor across the street spotted me in battle and came out to offer me a new weapon. It was some kind of forked shovel thing - I've never seen anything like it before, but let me tell you, it can beat the crap out of solid red rock dirt. Thank goodness for wonderful neighbors who loan out their fork/shovel thingies. And their hedge clippers. Lawn mowers. Wheat grinders. Ice cream makers. And folding chairs. And amen to the stylish friends who give me their hand-me-down clothing. I would be a fashion disaster without them. Benefit to planet: Fewer resources bought means fewer resources used. 2. A strong community has "More Fun, Less Stuff." When I was a kid, we didn't have cable television. The original Nintendo came out when I was in elementary school - we didn't have one. We had a computer, but it was barely good for anything (definitely not for gaming). What on earth did we do for fun???? We lived in the most awesome neighborhood ever. We rode our bikes up and down our subdivision, climbed trees, built forts, played "Bloody Murder." No one ever worried about us getting hurt, lost, or stolen because everywhere we went, someone's mom or dad was keeping an eye out. Benefit to planet: When you get your enjoyment from being with people, there's less of a need to fill your life with the latest toys and gadgets. 3. A strong community is safer. As I said above, my friends and I ran wild as children, but we had a whole community looking out for us. I read an article recently in the New York Times discussing why children don't walk or bike to school anymore. The article began with the story of a seven-year-old girl who walks a block and a half to school. Many people have told the girl's mother they can't believe she lets her daughter walk to school alone - isn't she afraid of the "abduction monsters?" And I admit I wouldn't let my children walk to school by themselves if they were that young. But the article mentions that the girl walks past "older children waiting with parents for buses to the same school" and that a "crossing guard helps her at the intersection." Wait a second...She's not alone! Where's that community that should be watching out for her? Why can't the parents take turns "walk-pooling" the kids to school? A real community looks out for its members. Benefit to planet: When parents feel like their children are safe, they are more likely to encourage them to play outside rather than plugging them into the TV set and the intertubes. When people feel safe, they are more likely to walk or bike instead of drive. Fewer toys bought, less resources used, and healthier people to boot. 4. A strong community is a time saver. There's a trend among environmentalists to seek a life of self-sufficiency - plant a garden, cook from scratch, sew, knit, crochet...some even dream of going off the grid. The truth is that we can't do everything all by ourselves. But we can do it all as a community: we can swap food, skills, and resources. Green Bean has given great examples of this with her green moms group that also swaps snacks. Benefit to planet: Those do-it-yourself acts - especially when done as a community - can save resources and connect us to the earth. 5. A strong community cares for each other. When you feel like you know the people and you belong to a place, you are more likely to care what happens there. Think Erin Brokovich. Global warming, schmobal warming...But the lake where I've taken my kids swimming - the lake where we get our drinking water - closed because of pollution? Uh uh, not in my community! Benefit to planet: A community that cares for each other will work to solve environmental problems. One final thought...Strong communities are just plain happier. Think back on the times you were happiest. Was it time you spent with your stuff? Maybe, but I doubt it. For me, my happiest memories have all been times I spent with my husband, my children, my parents and siblings, my neighbors, and my friends. Being part of a community makes us happy. My boys enjoying(?) chocolate chip cricket cookies. (Re:More Fun, Less Stuff) So true! So true! I often joke with folks who miss hearing birds singing, children playing, and the company of neighbors because they sit inside with their surround sound systems. Their loss; they miss out on what's real. I LOVE how your city hosts these get-togethers to bring people together. There's something for everyone. Awesome! Fantastic post. I absolutely agree that, without community, we cannot make it. I mean this individually and as a society. Another great resource I've recently come across for sharing the burden (a la the snack swap) is Hyperlocavore. It is a tool that enables people to share yards, swap produce and such locally. Such cool way to build community with other gardeners and locavores. I am fortunate to live in a community that shares resources, cares for one another, and keeps an eye out for everyone's kids. I sometimes forget the good stuff in the day-to-day living. Thanks for the reminders! 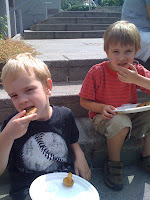 PS Bug Fest sounds like great fun - thanks for including the shot of your kids and their, um, delicious cookies! I didn't know what community meant, until I moved to a small city (Dunedin, New Zealand). I'd forgotten what it was like for me growing up and knowing everyone in every house around. These days, it's a rare occasion that I can go into the city and NOT see someone I know. And I look forward to my kids knowing everyone in their street, just as I used to. Community is so important. I love being a part of this community - I feel like I know people here and am a part of things far more than I ever was in the massive city of Melbourne (3 1/2 million people), where I used to live. Privacy is all very well, but when you live next to someone for 5 years and don't even know their name, that's pretty awful. You don't have to be best mates, but you should at least know each other! @The 4 Bushel Farmgal - I love my city too! And you're right that when we get too caught up inside with our techy toys, we miss out on so much. @balmeras - Yes, I thought of you when I was writing the section about playing outdoors as a child. We need to create safe communities so our kids can have the same freedoms we did as children! @Green Bean - Thanks for sharing that resource! I'm going to have to suggest something like that for the community gardens group we have starting up here in Raleigh. @Alline - You're really lucky to live in such a great community! Simple pleasures are the best. I enjoy gardening, reading a book outside on the swing or on the deck, or baking something fun in the kitchen. My son and I go to lunch whenever we can; we focus on small, local places. It's so much more fun! Hooray for strong communities! I believe it is what will help us heal as a local and global community.